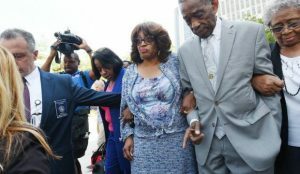 Former U.S. Representative Corrine Brown is facing possible life in prison after she was found guilty of taking money from a charity that purportedly gave scholarships to students who were poor. The verdict on Thursday came after a pattern of fraud had been established by prosecutors of both Brown and a top aide that included the use of hundreds of thousands of dollars out of one foundation for trips, shopping and lavish parties. Brown was found guilty of 18 of 22 charges brought against her, including lying on congressional financial forms and her taxes. A Special Agent from the Jacksonville FBI office said that public officials who are corrupt undermine the government’s integrity and violate the trust of the public. The guilty verdicts concluded the dramatic downfall of the former congresswoman, who at one time represented Florida from a district that included Jacksonville. A Democrat, Brown was one of three African Americans to be elected to the U.S. Congress since Reconstruction from the state of Florida. She watched as the judge read every verdict in a courtroom that remained quiet with no reaction. She left the courthouse following the verdict with a companion followed by members of the media. A few of her supporters shouted to her to “Keep the Faith,” as she made her way silently to a car. Since last summer’s indictment, she had been defiant in public over the charges by the government, saying in a prepared statement she had been amongst the black officials elected who were persecuted. She pleaded not guilty to every charge against her including fraud, but lost in her re-election bid last November following her indictment. Key to the conviction by the government was testimony of Elias Simmons the former Brown chief of staff and Carla Wiley a president of the charity. Both of them pleaded guilty following their indictments for misuse of charity funds and both testified against her. Federal prosecutors said the former congresswoman along with some associates used the foundation to receive over $800,000 from 2012 to 2016, including a golf tournament played at the TPC Sawgrass. The indictment against Brown said the foundation, based in Virginia gave out one $1,200 scholarship to an unknown person in the state of Florida. Simmons testified that Brown had ordered him to take checks and cash from the foundation’s account. On many occasions, he said that he had been told to withdrawal the maximum of $800 from a nearby ATM and then deposit the money into the personal account of Brown.